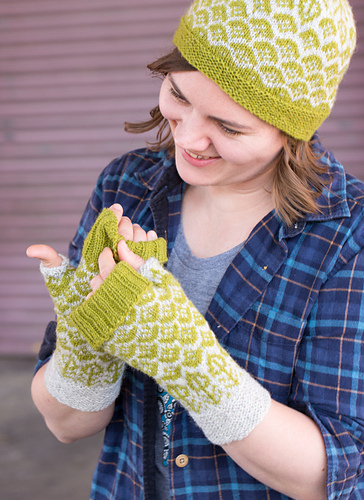 Two small, portable projects for early summer so you’ll be ready when icy winds blow: fingerless mitts and a coordinating hat. Fingerless mitts simply because I don’t find myself wearing full mittens very often, but fingerless mitts are always useful — even when the icy winds are from over enthusiastic air conditioning. The hat begins with a garter stitch band shaped with short rows so that it dips down to cover the ears, shaping for the crown worked into the colourwork pattern. 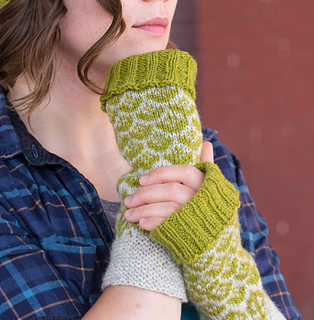 The mitts are worked from the ribbed cuff at the knuckles down (up?). This long cuff can be work folded back when you need to use your fingers or unfolded for extra warmth. 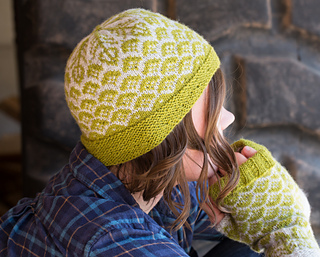 The mitts feature the same stitch patterns as the hat and a thumb worked by binding off and then casting on stitches on the following round. More stitches are cast on than bound off and the additional stitches are decreased in a single column that creates a diagonal line following the life line on the palm. The mitts are finished with garter stitch cuffs and stitches are picked up around the opening left for the thumb which is also worked in stranded colourwork. The Ornäsbjork is a type of silver birch that’s the national tree of Sweden. The colourwork patterns are inspired not by the iconic silhouettes of birch trees in winter but by their details: the textures and shapes of their catkins, trunks and leaves.